The Ambassador Apartments, also known as the Breadalbane Block, are located at 379 Hargrave Street in the Central Park area of downtown. A historic apartment block, the 8th oldest in the city, the Ambassador Apartments have the distinctive "flatiron" shape and Neoclassical design elements of the early 20th century. This building received municipal heritage designation on May 5th, 1986. Imagine - you are a single young man newly arrived in Winnipeg in the year 1912. Perhaps you've immigrated from another part of the country, or another country altogether. Hearing about the prosperous City of Winnipeg (right in the middle of the Wheat Boom), you decided to head West and make your fortune, as an architect or in construction. When you arrive in Winnipeg, you've already arranged your accomodations - you'll be living with other fairly well-off young men in an apartment building. Apartments have grown in popularity in the past few decades, and are now far more sophisticated than their earlier counterparts, which were merely subdivided old Georgian or Victorian Buildings. You get off the train at the brand new Union Station (completed 1911) and make your way to your new home in boomtown. As you walk up, you see it's an elegant building on an oddly shaped street corner, making for a uniquely-shaped style that's been called "flatiron" for its resemblance to the household laundry item. Walking under the front door, the emblazoned title THE BREADALBANE passes over your head as you cross the threshold of your new life. The Breadalbane Block in 1969. From the Archive of Manitoba. The Breadalbane Block, now called the Ambassador Apartments, was built in 1909 for original owners John Duncan MacArthur and James Fisher. Fisher called the building after his own home back in Scotland, as did many other Scotsmen who were building owners. Designed by John Woodman, the building started out with featuring twelve suites on each floor, with the fifth floor designated as a restaurant and smoking room. Its distinct "flatiron" style was a result of the acute angle of the corner, and was built that way to maximize the space in an innovative design. 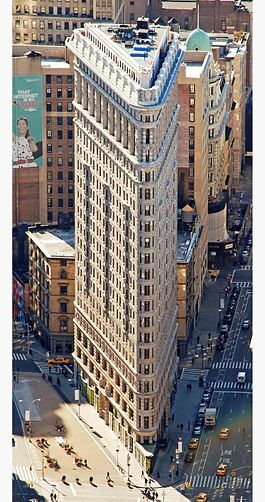 The use of the word flatiron to describe such a building became popular in 1902 when New York's Flatiron Building was constructed. The Breadalbane was distinct not only for its resemblance to the (in)famous Flatiron Building - the source of much controversy when it was constructed - but also for its other beautiful architectural details, such as the wrought iron balconies. New York City's Flatiron Building, built 1902. Many other elements contribute to the heritage character of the Ambassador Apartments, such as the stone belt courses that run along the building and distinguish three different levels of the building. Also, the main entrance to the building is quite elegant and reserved, with it being recessed from the main facade as to not interrupt the sightlines when the building is viewed from the corner bay. Interior elements that define the heritage character of this building include the front lobby, with its elevator and staircase made of wrought iron. The columns are made of concrete and are mushroom shaped (very unusual). The suites are not only well-lit and spacious, owing to the original design, but also come in a variety, including bachelor, single bedroom, and double bedroom. 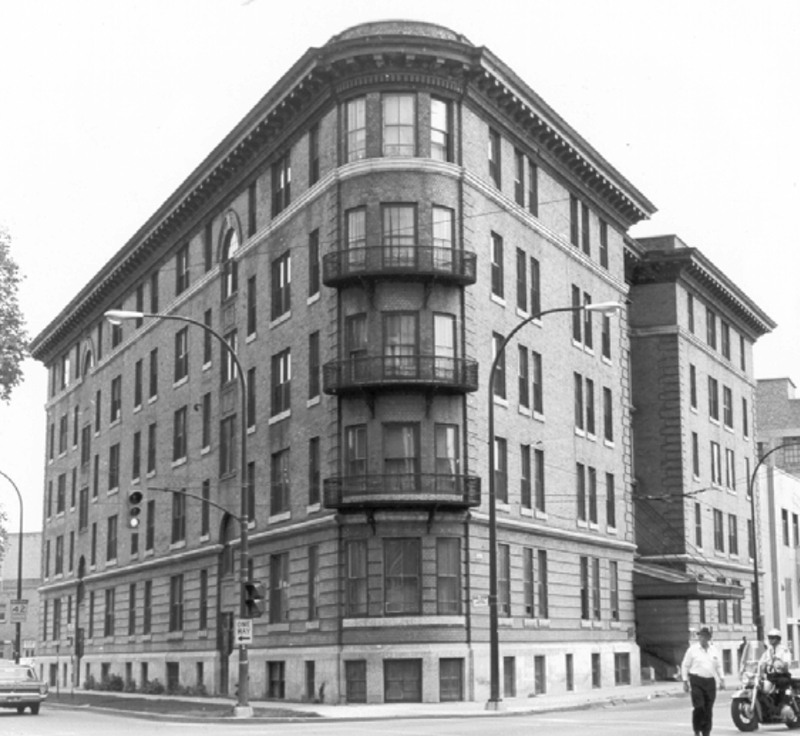 Prior to World War I, apartment housing was already very popular in Winnipeg, with over 300 apartment blocks as of December 6, 1906 according to the Winnipeg Free Press. The popularity of apartment blocks can be attributed to a number of different social and economic factors. Winnipeg, as a still-young but rapidly growing economic hub, attracted immigration from all quarters. Immigrants were more often young men and women moving to find employment than they were families, and if no family already lived in town then apartments were a good option for affordable, well-located, low-maintenance housing. Not everyone could afford the spacious, beautiful houses that were being built in areas like Crescentwood and Armstrong's Point, but they could afford a nice apartment in a good location. They would have had good transportation - maybe take the streetcar to work, or walk if it was close enough. Moreover, it was becoming more acceptable for young women in particular to live in an apartment, or a boarding-house, in the city. In 1927, the Breadalbane Apartments were sold to a financial agent, John McIvor, who installed more suites in the basement and the smoking lounge, increasing the total capacity of the building to 70 units. One year later, the building was renamed "Ambassador Apartments" by McIvor, though no word on what in particular made him choose that name. The building proved very popular, and sustained high occupancy rates into the 1950's. By the 1960's however, it began to have a greater turnover of tenants, as the building grew older. Although the building was due for a rejuvenation, that did not come until later. First, the building was recommended for heritage designation in September 1985, by the building's then-owner. The City of Winnipeg Historical Report was completed two months later that November, and the building was evaluated in early 1986 - in no time at all! It was recommended for designation as a heritage building, for its status as the only flatiron-design building in Winnipeg among other things. The Ambassador Apartments officially received municipal heritage designation on May 5th, 1986, less than nine months after it was first recommended. 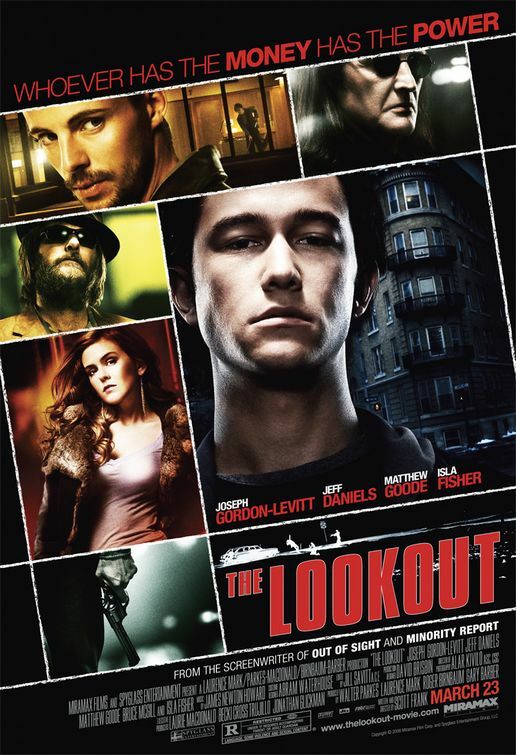 Theatrical poster for The Lookout. Note the Ambassador Apartments directly in background! The Ambassador Apartments are a fine example of early 20th century Neoclassical apartment design, and remains a defining feature of the streetscape in the area. It has been continuously operated as an apartment building, its original use, for over one hundred years, and is Winnipeg's only example of the flatiron building style. Thanks to being designated on the City of Winnipeg List of Historical Resources, this apartment building has been protected from demolition, providing much needed residential space in the downtown and character to the urban landscape.